Buttigieg was proposing 15 justices, 5 democrat appointed, 5 republican appointed, and another 5 appointed unanimously by the prior 10. That in itself seems sensible, and might end the bloodbath with every SPC appointment being another political circus. That’s absolutely correct. If Republicans didn’t want Democrats packing the Supreme Court, they shouldn’t have done it themselves. But once they stole a SCOTUS seat that was rightfully Obama’s to fill, all bets were off. I’ll jump in to at least defend the UBI here. While I understand you’re trying to simply draw parallels to the ’30s, I think it’s important to recognize where support’s come form in the past, with big names like Milton Friedman and Richard Nixon both in support of the UBI. I’m rather libertarian all things considered (voted for libertarian candidates last few election cycles), and I think if we’re approaching the welfare issue, this is the right move. For one, it aligns incentives – none of this welfare trap nonsense or welfare royalty since working doesn’t reduce what you get. Second – it’s’ not enough for subsistence – $12k a year isn’t even above the poverty line, let alone where anyone ought want to live. The kind of dependency that will be generated will be far weaker than the current welfare system. And that brings to the third point — while Yang doesn’t want to remove current programs, a UBI clearly paves the way for clearing bureaucracy and other welfare programs. Print all the money you want now. The favored first recipients in the chain make out like bandits, the last end up holding an empty bag. At least when it grew on trees, you had to wait until the leaves fell off and blew away. You haven’t actually read any MMT have you, James? MMT categorically does not say that govt can print all the money it wants without ill effects. It odes say that govt can spend money into the economy where there is unused productive capacity. And yes, MMT does recognize that inflation is a thing, especially where productive capacity is insufficient to expand to use the extra money. Controlling inflation is of course one of the thinks tax is for. Pack the court? First increase from 5 to 8 the size of a B-ball team. See how that works. Same for football. Put 15 guys on each side. Ha! My point is they are working fine with the crewing they have now. And IMHO, so is SCOTUS. A minor nuance here, but the conditions in 1921 Germany was that they had to pay reparations in gold. Germany’s gold reserves were long gone by then, and so they had to buy gold on the world market. But, understandably, the world did not trust the German currency and it took more and more currency to buy gold to pay the reparations. Then, the trigger for runaway hyperinflation was when some reparation payments were not met. France used their military in the Rhineland to take their reparations directly from Rhineland factory output. This caused the workers to strike and caused some worker riots and resulted in the French army killing a few hundred workers. The German government panicked and promised the factory workers that they would be paid regardless. That’s when the government started printing money big time and that’s when hyperinflation took off. The Green New Deal could also be called the Green Leap Forward. Liar. MMT doesn’t say that at all. Why the need to lie about it? Are you misinformed or malevolently lying to push an agenda? Ah yes, the old gold-standard canard. So here is a secret. We live in a capitalist society. Prices are always set at the highest the market will bear to maximize profits. When there’s more money, you don’t raise prices, you increase production. The only time you raise prices is if you run up against resource limits like a lack of raw materials, labor, or monopolistic behaviour. And this is where MMT specifically states the federal expenditures and deficits must not go. And since you do not explicitly acknowledge this, it makes you a liar. Apart from the Dems’ obvious desire to buy votes with public funds, another reason for the emergence of 1930s socialism is the American people’s willful ignorance of their own history. Despite the ready availability of information provided by educational institutions, libraries, and the Internet, the contempt of our fellow citizens for history – their own or anyone else’s – is legendary. The ubiquitous belief that a knowledge of history has no practical value is a besetting sin of our people and, I believe, will eventually lead to the downfall of this great nation. When was the last time a Democratic Supreme Court nomination turned out to be a bloodbath? I really can’t recall. Not in my lifetime. The bloodbath seems to be rather one-sided, going back 30 years now. There is another version of the FDR court packing story. It that version, the threatened expansion of the court intimidated the sitting justices and encouraged them to be more responsive to the needs and desires of majority of the American people instead of representing the old gilded age elites. I suppose it depends on which history you choose to read. I might as well pile on regarding MMT – clearly you do not understand it. MMT does not state that governments can spend all the money it wants – it does recognize that there are real resource constraints, and that is what drives inflation. In an economy that is running at less than full capacity, then, the amount of government spending is not an issue. We’ve actually already had a real-world test of this proposition – the government’s response to the financial crisis of 2008. Many economists predicted that the stimulus spending would result in inflation, while the MMT’ers predicted that it wouldn’t happen. It turns out they were right about that. Also, MMT’ers are definitely not proponents of UBI. Their preferred policy prescription is actually a jobs guarantee. If you’re interested in reading up more on this, you can refer to the New Economics Perspectives blog. Finally, Dr. Kelton is a professor of economics at Stony Brook. Counterpoint, Pinkerton left out the whole reason the left is gaining traction on these issues is due to 40 years of conservative lead abandonment of Christian principles in favor of Ayn Rand predatory capitalism. In practice, this meant conservatives said “lets set the govt on fire” and turned the management of our civilization over to sociopathic CEOs, who would gladly indenture 80% of the nation if it could get them an additional mansion in the Hamptons. Some of the architects of this disaster include the very Bush and Reagan admins Pinkerton is so proud of. Why are people abandoning capitalism? Because Kylie Jenner, of the Kardashian clan, is worth over 1 billion dollars after doing precisely nothing of value for our civilization. Via Randian belief, the market is valuing her properly, and she really is worth more than 1 billion due to the market service she provides. Meanwhile, public school teachers, some of whom I know, make dirt for pay, sacrifice their own limited funds to buy school supplies out of pocket, and are entrusted with training our next generation of Americans. Likewise the market is supposedly “valuing” them properly as well. There are legion more examples of this sort of madness, and the “horrors” of welfare fraud pale in comparison to this sort of collective cultural suicide in the name of mo’ money and objectivist navel gazing. All the screeching about how evil gubmit regulations are holding us back has NOTHING to do with this vapid 21 year old being worth 1 billion plus dollars and having done nothing of actual value. To anyone who’s not a brainwashed Randian doofus this is obviously insane on every level. Thus the younger generation and screwed over gen x members are rejecting both the dogmas of capitalism along with the old guard of failed, corrupt leaders who empowered it. Pinkerton is whistling past the graveyard. Unless some sort dramatic rebalance happens to American capitalism, and quickly, Pinkerton and his pals are screaming “let them eat cake” out the windows with the sound of guillotines being built in the distance. It’s the bread lines and obvious pollution in all out big cities . Oh, it’s not? Why should anyone feel “gratitude” for a country determined to steal from them? As to court-packing, the proposal, then and now, just reflects the willingness of the Democrats to cheat. Integrity and honesty seem to be utterly lacking in the lot of them. Many economists say we have seen lots of inflation, just not in consumer stuff the government measures as price inflation. We’re seeing it in stocks, bonds, real estate, gold, etc., all of which have been sent much higher because of the money creation. Another anti-Democrat diatribe to distract from there being little positive to write about the GOP of 2019. The GOP is more modest: it only wants to return to the early 1960s, before Civil Rights legislation, integration, and equal opportunities for women. Strip the court of the power to decide contentious social issues-issues that should be left to the compromise and negotiation of the legislative process. The left will win far fewer victories that threaten our economic and religious liberties. The real solution is to keep Republican administrations in power until a conservative majority is secured for the forseeable future. Kylie Jenner has yet to tax me one fat shekel.My Senator and neighbor,Robert Menendez,travels all over the world doing unspeakable things on my dime. The author is merely pointing out that today’s progressive agenda consists of ancient and discredited policy ideas. After the Amazon-Long Island City debacle the Democrat Party has little choice except to crush AOC and her Jew-baiting friends even if it re-elects Trump in 2020. Keeping the House and flipping the Senate would be nice, and a miracle might always develop in the presidential race. While the affection leftists feel for UBI is understandable, it is a mystery to me why anyone with at least half of a brain is attracted to it. Tax revenues will nose dive and drug and alcohol addiction will soar. The dependent class, so loved by liberals, will increase by 2 to 3x. It really has to be one of the worst public policy proposals ever advanced. FDR would not recognize the democratic party of today. Like Reagan said,”I did not leave the democratic party, it left me”. As for hyperinflation, the actual MMT argument is that the limit on fiscal policy is inflation. Warren Mosler (a MMT founder) made a lot of money running a fixed income fund. I worked as a fixed income analyst for 15 years, and now write about bond market economics. If MMT policies were designed to lead to hyperinflation, trust us, we’d notice. The bailouts and quantitative easing set the stage for all this and it is an appropriate reaction to the welfare for the rich that has inspired it. Billions of dollars have been transferred to the Wall Street criminals who run casinos in which their bad bets were taken over by the government allowing them to socialize their losses and privatized their gains. What AOC wants is to have everyone participate in this scam. Why should the wealthy get zero interest loans and bailed out of the bad investments while the poor have payday loans at 500 percent? We have not had capitalism in the United States since 2008. What we have is an economy controlled by the Fed to the advantage of the wealthy. In short, it’s welfare for the rich and austerity for the rest. To all the wealthy I say” beware your heads”. It was recently written on the Arch de Triumph” “We beheaded people for less than this” Let the heads of the wealthy roll. Nostalgia can be good entertainment, but it has no place in public policy. The only use I have for F.D.R. is a good history book, not a lousy U.S. policy statement. I’m disappointed the columnist didn’t discuss Dem’s resurgent fascination with confiscating wealth (vs. taxing income). There’s a real game-changer, were it ever to be implemented. Why are you talking about stealing? Presumably you mean taxes levied by the government on your $$$. But remember, your $$$ are a creation of the state. Their value derives from the creditworthiness of the state. If you want do without the state, you must also do without the $$$. When you are living off barter and Bitcoin, then come back to us. 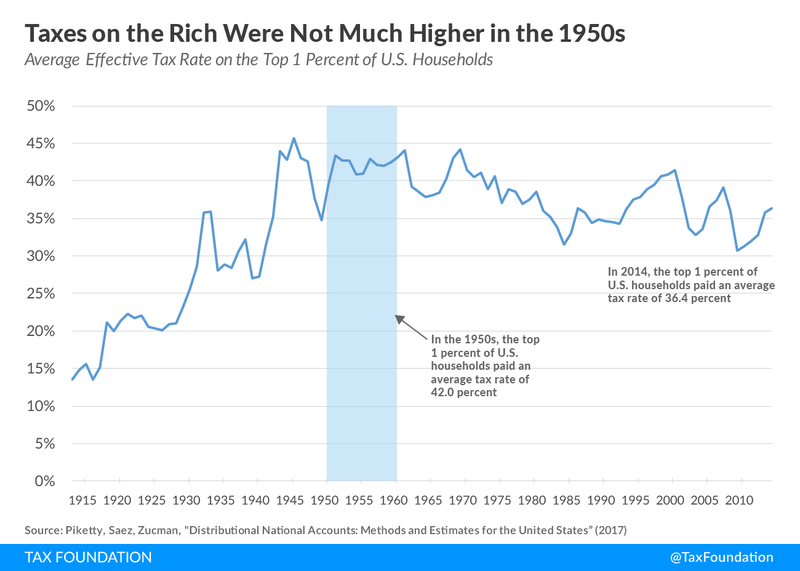 I’d settle for *some* aspects of the 1950’s – relentless enforcement of antitrust laws, merciless regulation of banks and financial institutions, a top marginal tax rate of over 90% (and far fewer loopholes compared with today). Actually, these were seen in the 1930’s as well. There was a downside. Besides the fact that large segments of the country were treated like third-class citizens at best, you had to tolerate the mewling of SJWs calling each other “literal Hitler” because Mary didn’t spell Billy’s name with an “i” instead of a “y” and Warren was demanding a safe space from Clark because Clark said that there are only twenty six genders and not twenty eight plus genders yet to be discovered and that violates Warren’s rights. It’s fascinating, this leftist nostaligia for mythology instead of acknowledging what the reality actually was. Here’s what’s incontrovertable, though: In the 1950s, deep in the Cold War, the federal government share of GDP was 25% LOWER than it is today. I’ll give you your top marginal tax rate back if you give me that giant spending cut across the board. To date, nobody’s taken me up on that offer.